"The flower that follows the sun does so even in cloudy days." I love Magnolia trees. They are so beautiful and fun to photograph. Magnolias trees are so beautiful. They line the streets of Southern Ca but here in the north I planted one which never grew an inch in 20yrs. Guessing they love heat. Magnolias are one of my favorite trees. Their leaves don't shed excessively, and their flowers are huge! Water drops on buds are so dramatic. Nice shot. 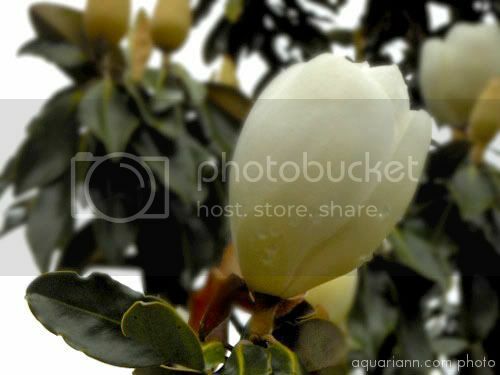 Great shot of a Magnolia tree! I also love the quotation! Thanks for hosting. Beautiful, and I also love the quote! I love magnolia blossoms. Thanks for sharing. I love magnolias! Thanks for hosting,have a great week. Beautiful! Ours are blooming down here, too. I have one in my front yard....I love it. Beautiful flower, beautiful quote. Thanks for linking up for WW! Great job as always! I love the water drops detail. Love magnolias. There are two trees outside my daughter's school and the smell when they're flowering is just amazing. You have a wonderful eye for photographing flowers! I love the composition and the delicate droplets. I'm sorry usually I comment back earlier. I love these trees! I only can grow dwarf ones where I live. I used to live in Savannah, GA. They had HUGE Magnolias. They were so pretty! Oh how I miss the big Magnolia trees. I love their scent and their waxy leaves and tough fragrant petals. So many childhood memories of climbing my grandmother's magnolia in Georgia. Beautiful photo. Hey there! I found you via the blog hop and just added myself to your followers! Maybe you could follow back? :) Also I wanted to invite you to come enter a huge Steve Madden giveaway I'm having right now!! Hope to see you there! And thanks so much lady!